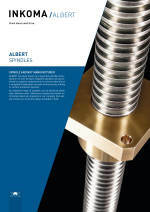 ALBERT has been known as a specialist spindle manufacturer for over 30 years. Bespoke spindles can be produced to customer requirements in various materials as a complete finished part inclusive of any turning, milling or surface treatment required. An extensive range of spindles can be delivered within short delivery times. The ALBERT trapezoidal and buttress spindles are produced by either whirling or machining.